Y'all know how much I love to ride in my stroller. Well, so many of my big dog pals keep telling me they wish strollers came in their size, that I went searching for one. Guess what! 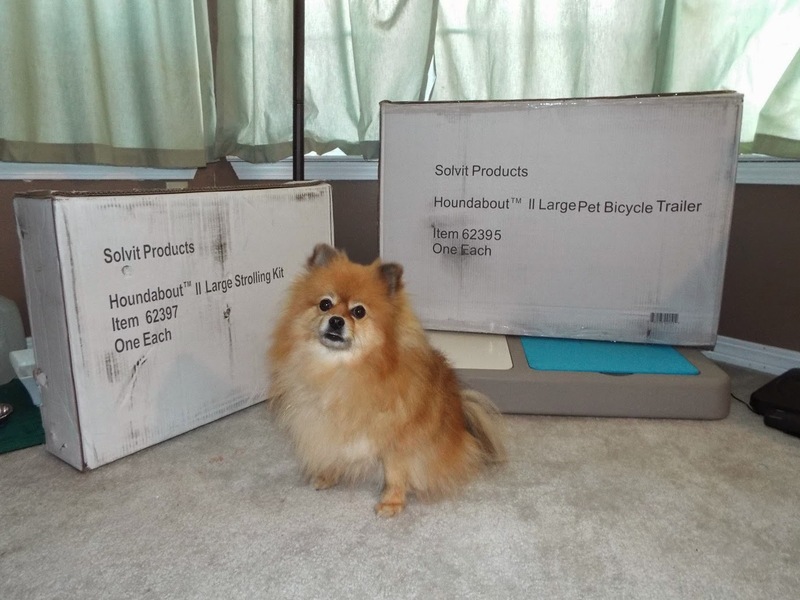 I found a big dog stroller from Solvit Products! Ta-Da! The stroller dream of large dogs has come true. I have 2 big boxes! I wonder what's inside of them. I don't smell any treats in them. Technically your human needs to order two items. 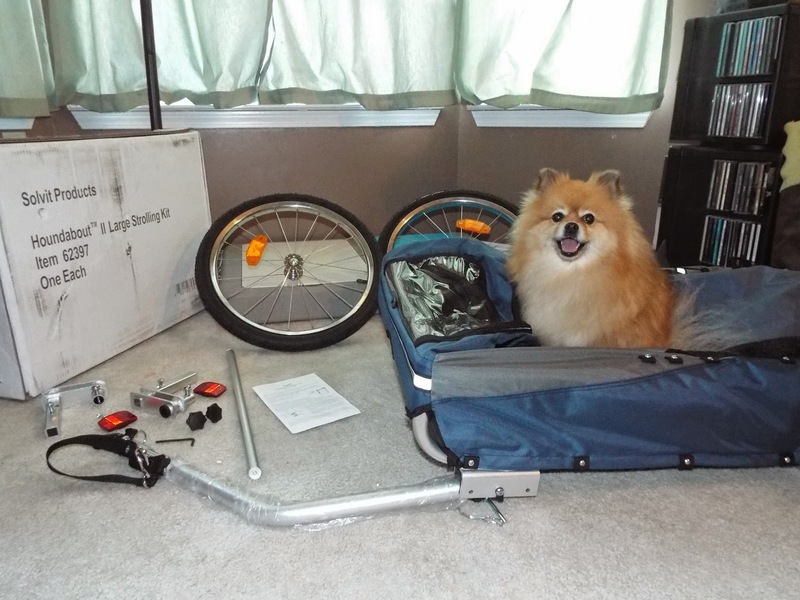 The first item they need is the HoundAbout II large bike trailer (item #62395) this is the body of the stroller, floor pad, and rear wheels. 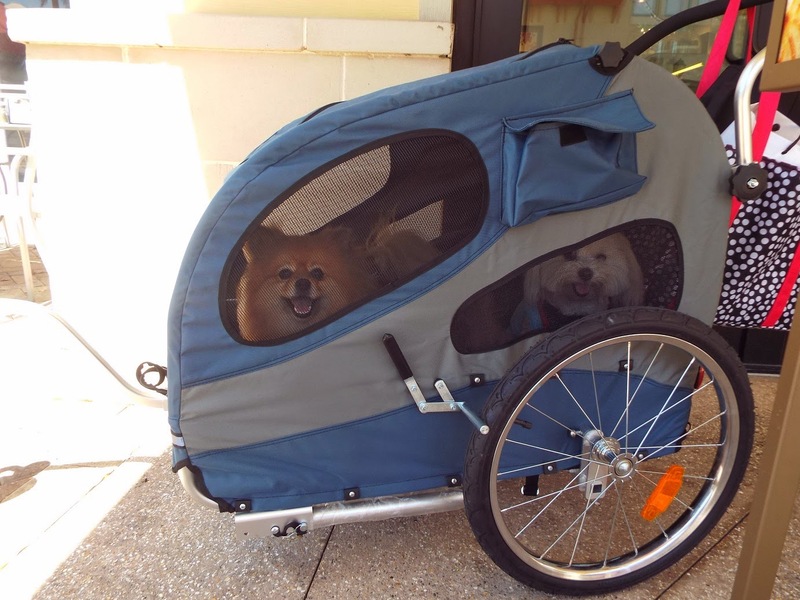 The other item they need to order is the HoundAbout II large stroller conversion kit (item #62397) this has the front wheel, padded handlebar with cupholder, and parking brake. 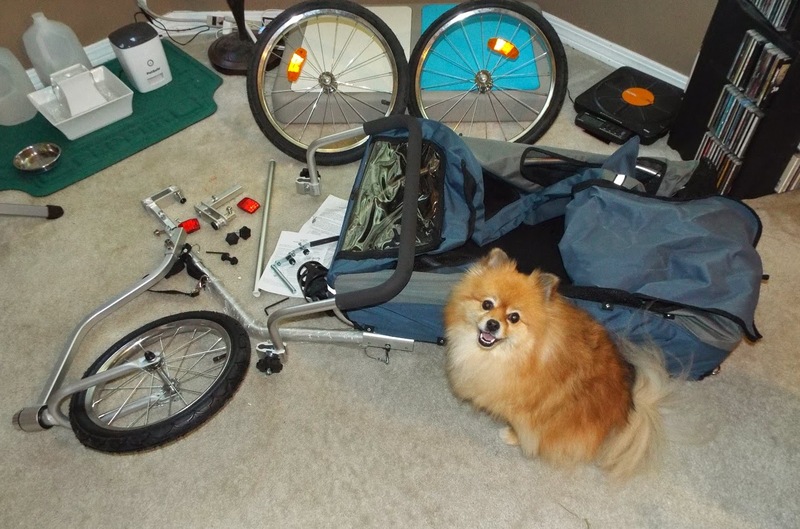 Mom and I don't do the bicycle thing, so I'm only going to bark about it as a stroller. 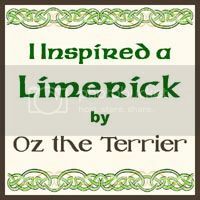 You would need to ask my pal Oz the Terrier about bicycling stuff. I do know the HoundAbout II has a towbar to hook to a bicycle, safety reflectors on the rear tires, and safety reflectors on the back of the trailer body. The towbar folds and locks underneath the body when you convert it to a stroller. Yes, there is some assembly required before it looks like a stroller. Of course, I am impatient and jump right in. Hey Mom, I'm ready to roll! Oh, okay, I'll wait for you to put it all together first. It looks like a lot of parts, but it was easy enough for Mom to assemble it all by herself. Well, she did need a phillips screwdriver and adjustable wrench. There is a hex wrench included in the box. Now my new large Solvit HoundAbout II stroller is ready to roll. Baron wants to come for a ride too. Mom has the parking brake in the "on" position in this photo. This roomy stroller has plenty of space for both Baron and I. Both of us have room to lay down. Don't tell Mom, but there is enough room for cousins Bailey & Amanda too. I really don't want to ride in the same stroller as my cousins. To be honest, Baron is the only dog I tolerate sharing things with. 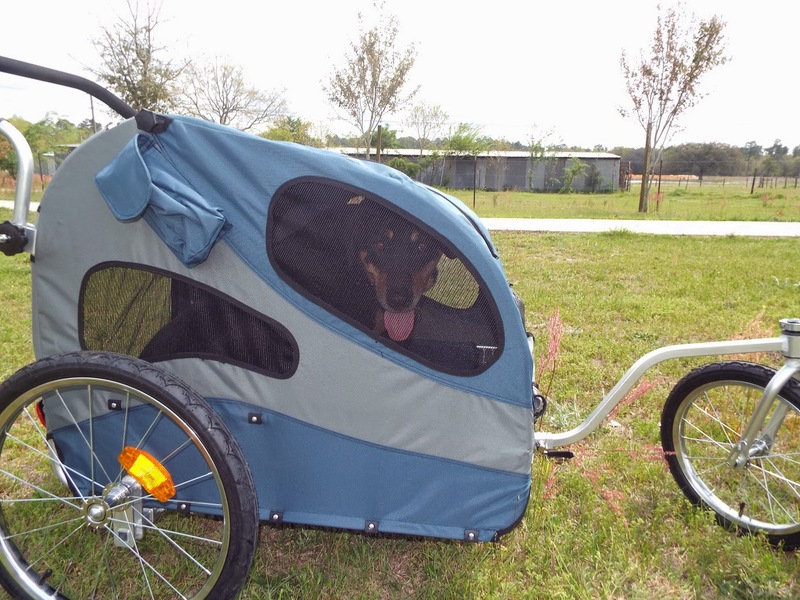 The Large HoundAbout II trailer/stroller can hold dogs as large as 110 pounds. The trailer body measures 33x22x26 inches. The HoundAbout II has 3 openings: a large one on top, a large one at the rear, and a small one in front. Large dogs use the rear opening to get in and out since they are too heavy to lift up through the top. The top opening is a fabric zippered flap, the rear and front openings are mesh zippered flaps. The front opening also has a zippered waterproof rainflap to protect dogs from bicycle tire splashes in wet weather. Each opening has an elastic strap and toggle to hold them rolled up when open. There are 3 pockets with velcro closures on the trailer body, and a plastic cupholder on the stroller handlebar. 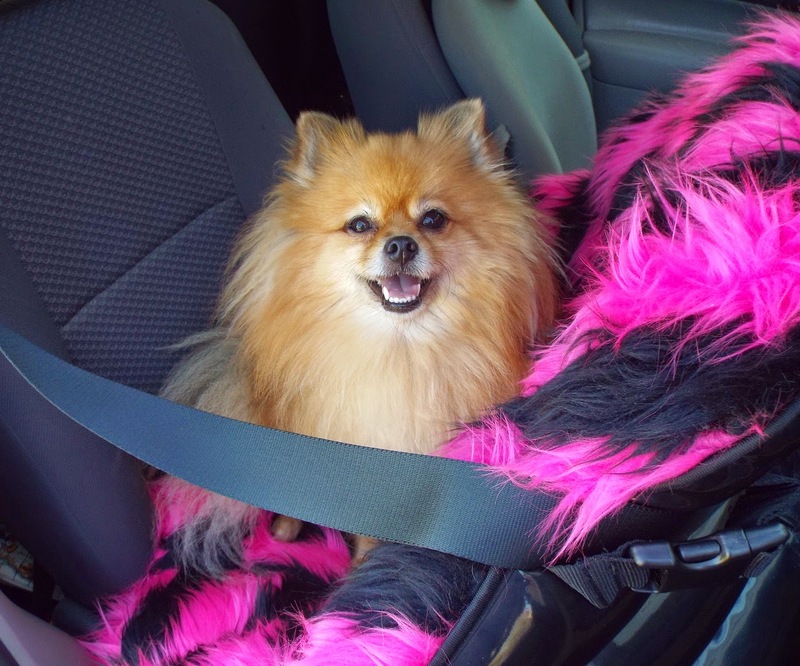 The pockets and cupholder provide enough space to hold your treats, poop bags, human's cell phone, keys, water bottle, collapsible bowl, and leash. Mom attached a totebag to hold her camera, purse, and shopping bags. The HoundAbout II is so large that Mom was surprised that she was able to fit it in our small compact car, after some disassembling. It was fast & easy to do, and Mom didn't need to use any tools. Because our car is small, we have to take it apart more than someone with a large SUV would need to do. To fit the HoundAbout II inside our little Focus, we need to remove the center support & fold the body down, remove all 3 wheels, and remove the handlebar. Some vehicles may not need it to be folded down, or need the rear wheels removed. I think most vehicles would need the front wheel and the handlebar removed. It takes Mom less than 5 minutes to put everything back together. The HoundAbout II folds down to 33x29x9 inches. It measures 60x33x40 inches when it is fully assembled with the stroller kit attached. The stroller handle is 39 inches above the ground. The HoundAbout II frame is Aluminum. It is lightweight for a stroller this large. 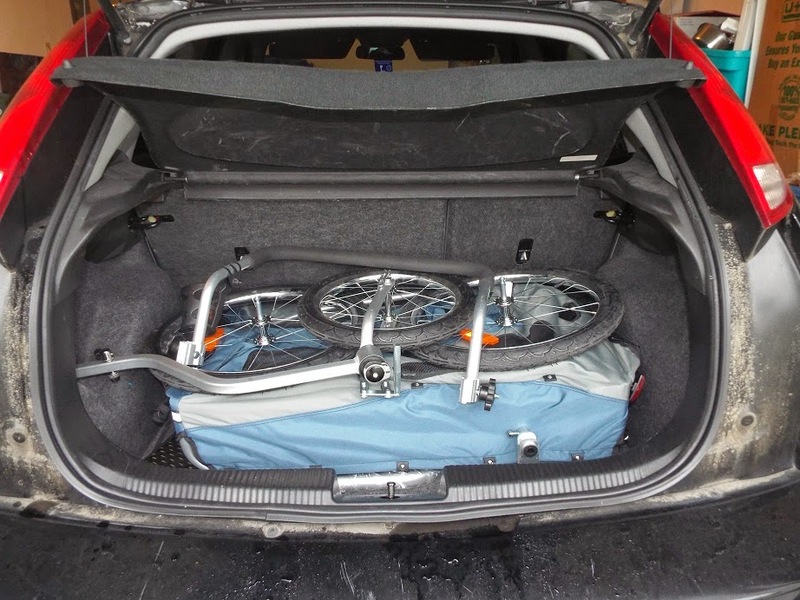 The bicycle trailer is only 25 pounds. The trailer with the stroller kit attached is 33 pounds. Even a small lady like Mom can lift it. Cousin Blue isn't 110 pounds, but she is the largest dog in our family. She lives with Mom's sister & her family, including cousins Lily, Bailey, and Amanda. 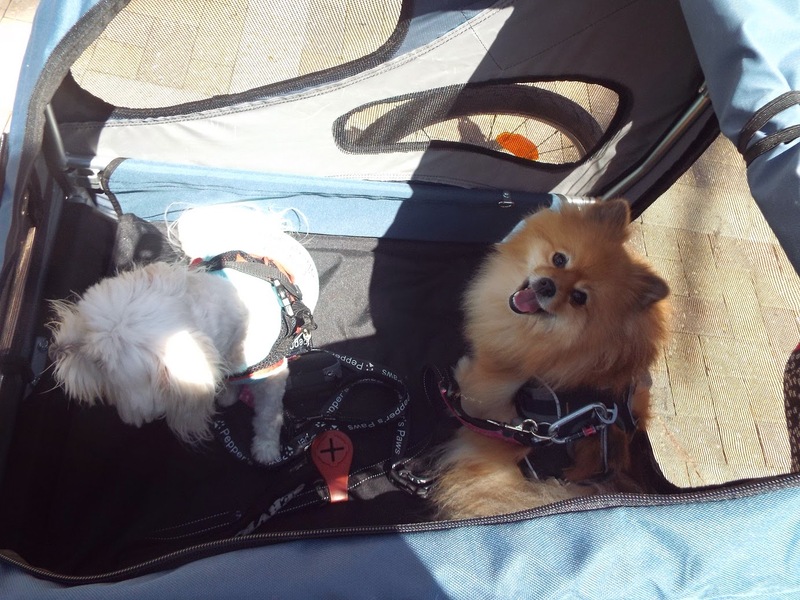 Cousin Blue fits in the stroller with the top flap zipped closed, but she prefers it open so she can feel the breeze. There is a tether to hook to your harness for when you leave the top open. 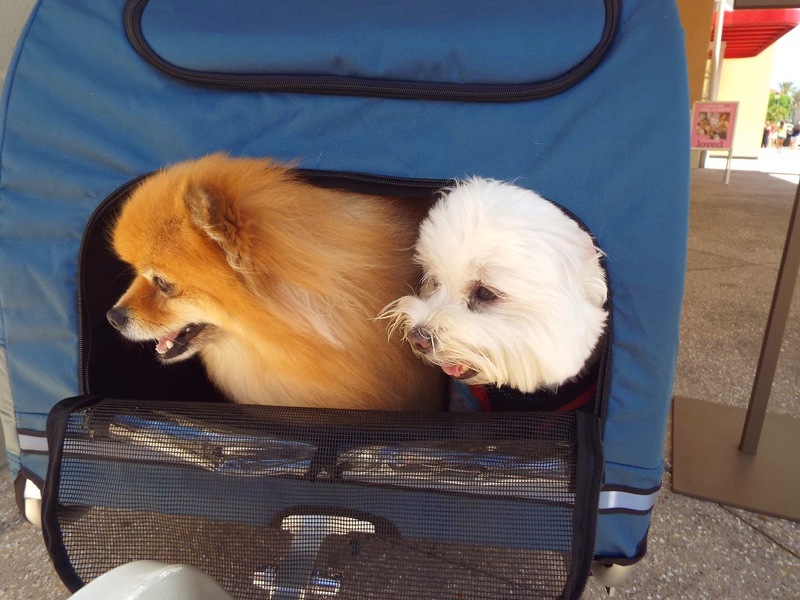 If your dog is not used to riding in a stroller, I recommend closing the flap so they don't try to jump out. Cousin Blue is the size of most big dogs (About the same size as German Shepards, Labradors, & Dobermans). The Solvit HoundAbout II is easy to push. Mom's youngest niece easily pushes cousin Blue in the stroller. I think Mom's niece and cousin Blue are about the same weight. The 20 inch air filled tires can comfortably go off road for trips to the park. However, it is not recommended to take the HoundAbout II in extreme off road conditions. It is easy to push on a grassy lawn, but it is probably not meant for deep mud or loose sandy beaches. I don't think any stroller is meant to endure those extreme conditions. Pawsonally, I've never tried to take a stroller to the beach or in deep mud. Mom really doesn't enjoy going to places that require special shoes like rubber boots. BOL! 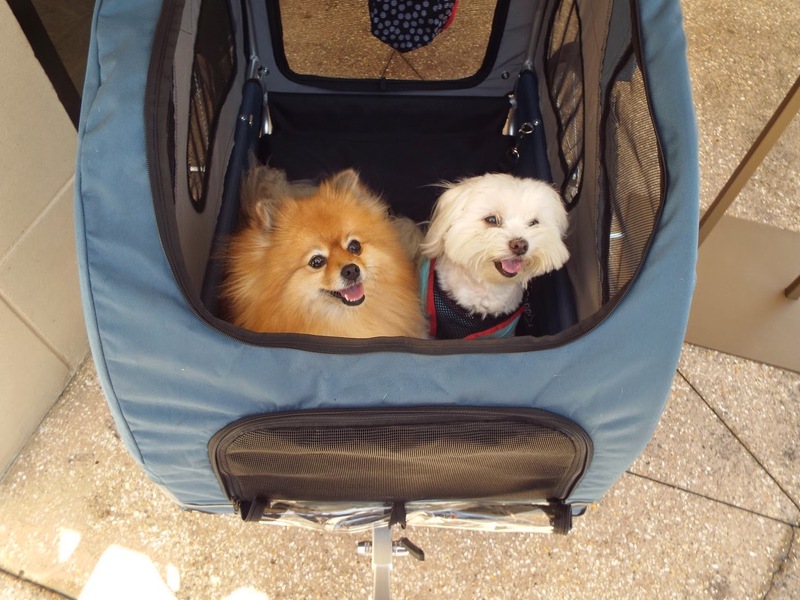 Baron and I may be small, but we love riding around in this large HoundAbout II dog stroller from Solvit! 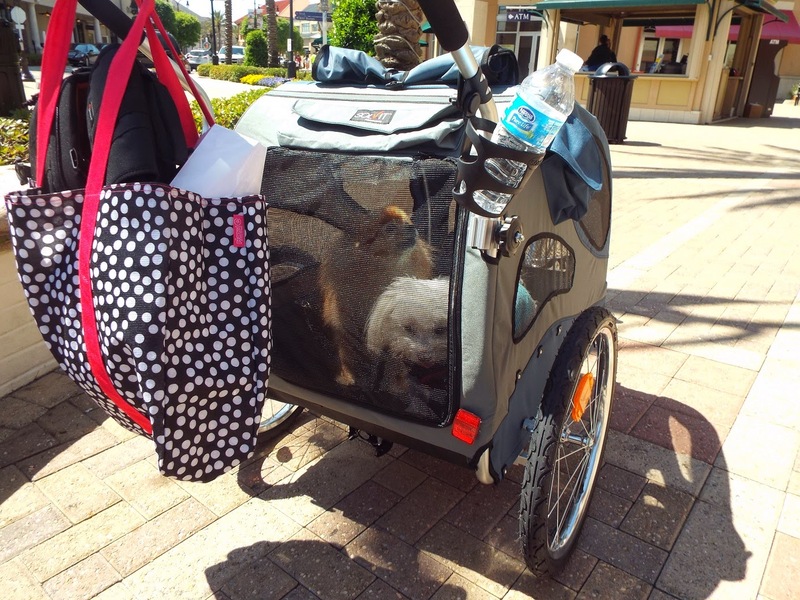 That is one super PAWESOME stroller, Pepper! I cannot believe you and Baron fit in there together. BOL And cousin Blue fits in there perfectly. I bet that is a sturdy stroller too...Solvit really outdid themselves on this product! My own hounds love to walk so I wouldn't need one for them, but I could see using this with disabled dogs or dogs that have had recent surgery and can't walk for themselves. I'm finding myself thinking that this might be a way to take my cats for walks, too (they're indoor-only). M wishes she would have gotten a stroller for me when they first adopted me. How they can't walk as much, so there is no need for one. Hind sight is better than no sight I guess. That looks like a great stroller pal. WOW! That is big enough for ME! That would be heaven to be able to be pushed around in a stroller especially when my back is bothering me. 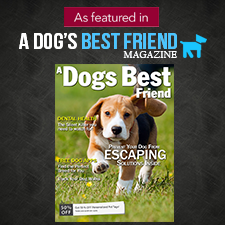 We went to the page but couldn't find a price but I know it is probably out of my budget. Great review and letting us know there are strollers for big girls like me. The adjustable hex wrench carries big dogs inside the box easily.